We’d love your help. 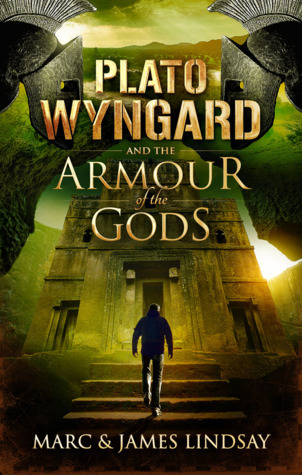 Let us know what’s wrong with this preview of Plato Wyngard and the Armour of the Gods by Marc Lindsay. To ask other readers questions about Plato Wyngard and the Armour of the Gods, please sign up. Just when you think nothing more can possibly happen to these guys, it does. Like the first book in this series the action is fast paced and non-stop. This is a book that you'll find hard to put down until the last page is read. This is definitely a five star book. Both the Valley of the Immortals and the Armour of the Gods are amazing books. Definitely a new favorite and I have my fingers crossed for a third installment. Can't wait to see what's next!! I loved the second book in this series. Great character development and another fast-paced storyline full of action and adventure. I highly recommend this book. After I travel to Vietnam (book 1) I'm going to Ethiopia. Great read for a lazy holiday! I think this book is very interesting, I love the genre action and adventure and I think anyone in the world would devour this book, I would read this book at any age in my life, but it's probably not suited for anyone under nine or ten years of age. I think if you would like James Bond, Alex Rider type of action books you would absolutely love this book all the way through. I love Plato and Luther and hate the bad guy. These are characters I care about. LINDSAY brothers are my new favourite action adventure authors. I was very excited to finally get a copy of the latest instalment in the Plato Wyngard adventures. Another fast-paced action and adventure novel from the Lindsay brothers. Following on from the Valley of the Immortals, the two heroes, Plato and Luther, are caught up in a dangerous game of revenge which takes them into Ethiopia and delivers a conundrum which they must unravel. Another nail-biting, edge of your seat ride which had me cheering the boys on every step of the way. Well written with enoug I was very excited to finally get a copy of the latest instalment in the Plato Wyngard adventures. Death and danger in Ethiopia. Rife with humour, action and intrigue. A fast-paced thoroughly engrossing story. More twists, more military action and more interweaving of mythology. And, unfortunately, more unpleasant surprises. New and intriguing characters, just a shame there're mostly a bunch of murderous psychopaths! Really looking forward to reading the next Death and danger in Ethiopia. Really looking forward to reading the next in this enthralling series. I loved it just as much as the first one, it kept me reading till night, I enjoyed it and so did my family. Born in 1972, Katherine, NT and married with three children I have always loved to read in particular fantasy fiction. My favourite authors include JRR Tolkien, Robert E Howard, Stephen King, Raymond E Feist and the awesome Matthew Reilly. Growing up I was always a bit of a geek, in particular my love of comics and horror movies, something that has stayed with me well into my “mature years”. I was Born in 1972, Katherine, NT and married with three children I have always loved to read in particular fantasy fiction. My favourite authors include JRR Tolkien, Robert E Howard, Stephen King, Raymond E Feist and the awesome Matthew Reilly. Growing up I was always a bit of a geek, in particular my love of comics and horror movies, something that has stayed with me well into my “mature years”. I was a soldier in the Australian Defence Force for nearly 20 years, having served on operations in Rwanda and East Timor, and later an instructor at the School of Infantry. I'm a qualified cinema graphic make-up artist, having trained under Oscar winner Peter Frampton, I had high aspirations of being the next Tom Savini. I enjoy keeping fit, reading and annoying my kids. I still love cheesy B grade movies in particular anything with zombies and I love hanging out with my brothers every chance I get, both of whom are successful writers in their own respective fields.